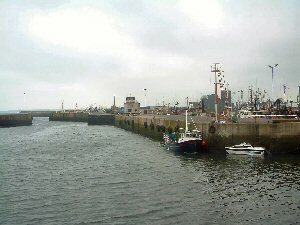 Fraserburgh Harbour is situated in the North East corner of Scotland and is ideally positioned for the fishing grounds of the North and East of Scotland as well as being in close proximity to the North Sea Oil and Gas fields. The location also makes it well placed for trade with Scandinavia and Baltic Sea ports. The original harbour dates back to 1546 but most of the current basins and quays were built during the 19th century. In 1894 there were over 800 fishing boats based in Fraserburgh, almost one for every ten people living here at the time. Walking around Fraserburgh Harbour today it is clear that the number of boats has shrunk, but also that their size has increased. Some of the very large fishing boats on view dwarf what you will see in most other Scottish fishing ports. Almost 100 fishing boats now operate out of Fraserburgh and the harbour area is generally full of activity with repair yards, boat painters and chandlers. Fish are landed daily at the fishmarket which opens at 7.30am (except Sundays). The current market is a modern building opened in 1987 and sells almost half a million boxes of fish a year. Catches include whiting, haddock, sole, cod, mackrel and herring. 35,000 tonnes of fish, with a value of £27m are now landed annually at Fraserburgh. The Harbour has easy access and safe berthing with approximately 2½ miles of quayside. Recent developments include the deepening of the Balaclava Harbour and entrance channel to a depth of 6.5 metres at MLWS. A depth of 7.5 metres is available on the north side of Provost Anderson's Jetty. Industrial ground for onshore development is also available. All berths can be available for commercial vessels or oil related traffic and each of the North Pier and Provost Parks Jetty have oil pipelines to a fuel storage tank. These berths can be used for discharging oil to the storage tank or for bunkering vessels. Maximum size of vessel afloat at all times is 90m x 16m x 6.5m draught. Fraserburgh has local stevedores offering a 24 hour service, equipped with modern cargo handling equipment, mobile cranes with a lifting capacity of up to 200 tonnes, forklifts and conveyor etc. All types of cargo are handled from bulk, general, fuel, containers and fish products.